Basically everyone who joined send off a package to FrauLiebe with five 50cm X 50cm pieces of cotton fabric and you get five different pieces back. I am pretty happy about the fabrics I got, eventhough two are from Ikea. I personally wouldn't send any of that since every sewer near an Ikea probably has enough of it. If I had gotten any of the other Ikea fabric I had spotted and own more then 3 meters each myself I might have been a bit more "meh". But I don't own or don't own anymore** of those two fabrics so I am a happy girl. * Yes, I actually own 3 yards of the top fabric. It was just too kitschy and hilarious to pass up. ** Actually gave all the leftovers of the flower fabric away years ago and later on regretted it very much! I have been wanting to sew my own dress forever and ever. I have been collecting quite a number of patterns, vintage patterns from fleamarkets, new patterns from stores, I even got a girl from the USA to raid a few sales to swap some patterns from Simplicity etc in exchange for crocheted skull squares. Two years ago I actually made three mock dresses from muslin, but I had lost quite a bit of weight and still didn't really knew what looked good on me and what didn't. Plus retrospectively I probably should have used different sizes for the top and for the bottom since I actually still had hips. So I cut out the pattern pieces from some navy fabric with white hearts and began sewing. I didn't wanted to line the dress top part as I think it is unnecessary with this type of fabric and dress style. Instead I used bias tape around the neck opening and armholes (Must remember to buy unpressed bias tape next time). Anyway, I just undid the zipper, cut away some fabric and reinserted it. Almost perfect, except for the transition between waist and hips. It rode a bit up when worn, because my hips are a tad bit wider and my waist line is a smidge above the one indicated in the pattern. I tried to remedy this by undoing the side seems and using some of the seam allowance to widen this part. Looks a bit better now, but I will have to remember to add atleast 1 cm to each side seem for the next dress. And now here is a bad photo of the dress. Hopefully next time I wear it I can get someone to take my picture and show you a better one then this shapeless one. I am often participating in swaps via craftster and thought it would be easier for my partners if I would write down a bit about my likes and dislikes. I will update this post occasionally. Last update: August 2009. I am a computer science student, who hopefully will graduate this year. I am minoring in physics. Yes, that is kind of nerdy and so am I! I love everything chocolate except for plain milk chocolate. But I do like the Cadbury milk chocolate. I am addicted to fleamarkets! For awhile I didn't go to any because I couldn't stop myself from buying even if I didn't really needed that item. I love kitschy things! I like all colours, except for orange and yellow. This is especially true for clothing items as these colours make me look sick. Some reds with an orange undertone also won't work. I won't mind yellow and orange where appropriate, say if you are making a bee-shape bag. I am into green-blue tones at the moment. 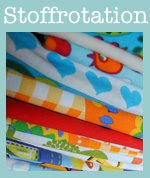 Quilting/patchwork fabrics are pretty expensive here in Germany, so I am always happy to receive cotton prints. I am not a fan of plaisley or animal prints. 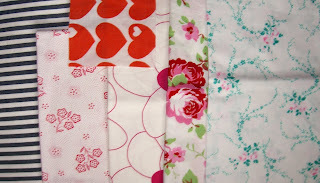 I am planning to sew a patchwork skirt with all different prints of fabric, but I will need over 100 squares! No way I could purchase that much fabric, but maybe you have some left-overs? I need 10cm squares, but 4inch squares would be ok too as the difference is marginal. I prefer natural yarns for clothing, like cotton, wool, alpaca etc. I wouldn't mind it if part of the yarn is acrylic, but please no 100% for things I will wear or hold in my hand. It is ok for amigurumis or dolls though to be out of 100% Acrylic. I own a spinning weel, but haven't spun much lately. Maybe some unusual fiber would motivate me again. I don't wear much jewellery and my ears are not pierced. I do love brooches though and wear them a lot. I prefer silver to gold. That's a tough one since it seems to constantly change. I am between an M-L for clothing at the moment. As a general rule bottoms need to be bigger than tops since I have hips. My shoe size is betwenn EU39-40. 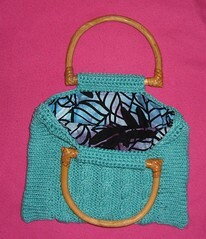 I can knit, sew and crochet quite well. I also spin, embroider, cross-stitch a bit here and there, though those could be improved a bit. I do some quilting and other crafts randomnly. Weaving, still searching for a place nearby to learn. Not that I could afford a loom of my own or have any space whatsoever for it, but it looks interesting and fun. Please see my wists. Check the comments on items though since some things are on there for inspiration only. I am a natural hoarder, but books are the worst. I LOVE books and can never part with any once I get my hands on them(I even keep books I stopped reading midway because I didn't liked them). So feel free to send me craft books and don't hestitate to send preloved once! I collect postcards. Normal touristy cards are fine, but I also like absurd, bizarre cards. I would love to have some more cards with words/sayings in foreign languages on them. Anything but romance and thrillers are atleast given a try. My favorit author is Terry Pratchett followed by Anne Rice. My favorit book though is "The secret garden". Everything Horror or Zombie. Sarcasm is good too or just plain silliness. Fido was great. I am a Hello Kitty fan and don't think I will ever outgrow this. I don't like items made from ducttape. I am still living at home with my parents so eventhough I like pretty dishtowels and similare household items they are not of much use at present. A plastic bag despenser...since I try not to use plastic bags at all. knit/crochet dish or wash clothes, I already own enough. I am very sensitive to scents and can't stand most. I am ok with most naturally scented soap. Please no heavy, artifical scents, they give me the worst headaches ever! no tiger prints ore zebra prints or any kind of animal print please! I myself quit smoking last December(2008), but my parents still smoke. Of course I wash everyhing before sending, but someone allergic might have a problem. I sure love to go to fleamarkets, I almost always find something. This time I found a really big glas jar for 2.50€. 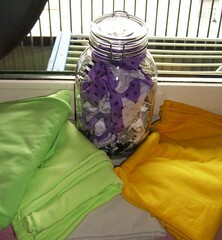 I saw a blog where the author stored the leftovers from used fabrics in a jar for inspiration. I rather liked the idea, but new jars are darn expensive I found out. My new jar now holds the leftovers from two shirts I sewed recently. And to keep up with all the shirts I have been sewing, I also found four different jersey fabrics at the fleamarket. Only 6€ for them all and each is atleast 1m long! P.P.S. : Yes, the blog template changed and probably will change even more. I tweeked it a bit, but I am getting sick of it and will probably write my own from scratch soon. 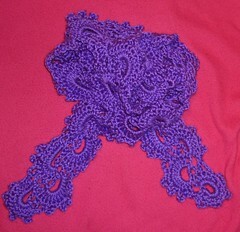 ...the following handknits wasn't easy. 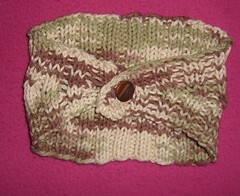 I made them for a swap on craftster and used some yarn I really liked. 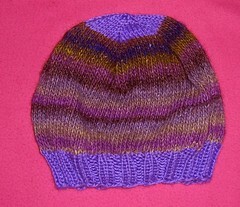 Especially the hat(Noro Silk Garden!) 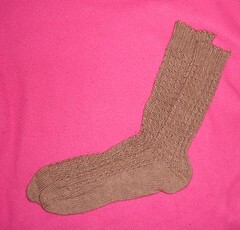 and the socks were hard to part with! yarn: Caron "Simply Soft Brites" + Schewe "Alpace de Luxe"
yarn: Caron "Simply Soft Brites"
yarn: Caron "Simply Soft" + Noro "Silk Garden"
I sorted through the yarn and crafty things I want to get rid of again today and made a few photos. 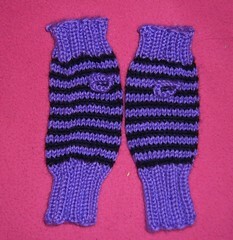 I also put them on ravelry, but have to think about how much I want for these things. I really just want to get it all out of my room as soon as possible as it is taking up space. Btw. some of the yarn I will set free to find new homes are from swap and sp's. I want to assure my former swap partners that I really liked the yarn, but everything that I can't imagine knitting up within the next year has to go. That really helped cleaning it all out and not cling to it because it could somewhere in the distant future become something else than just yarn balls using up precious space in my tiny room.